I’ve been thinking a lot lately about how we need instantiate our faith more than we do. To instantiate means to represent, to embody, or to externalize. I’ve been convicted that too much of my faith is “in my heart.” Do you know what I mean by that? That’s one of our favorite ways we talk about our faith. Believe in God from the heart. Accept Jesus in the heart. To put it bluntly, that’s not good enough. Now, why would I say that? I think there is too big of a disconnect between what we say we believe in our hearts and what we do. When faith in God becomes too heart focused it simply becomes good intentions that never materializes into authentic faith. Authentic faith – do you know what I mean by that? I mean faithful – actually practicing faith. Let me ask you a question: Do you want to have faith or do you want to be faithful? In one respect, there shouldn’t be a difference between those two, should there? If I have faith I should be faithful. But because we are imperfect people, because we are on the road to maturity and haven’t quite arrived, there is a difference between the two. And the difference often times is instantiation – good intentions vs. embodying or externalizing faith. And I’m afraid our emphasis of making sure our faith is from our hearts (which is a good emphasis) tempts us into thinking that as long as it’s there it doesn’t have to be anywhere else (hands, feet, mouth, pocketbook, you name it). Exhibit #1 – God told the people to eat the Passover meal year after year after year. Why? Was there something magical about the meal? Did God love the people who ate the Passover more than those who didn’t? Was God’s Holy Spirit somehow in the meal that if you ate the meal you would get more of him? Of course not. And couldn’t the Israelites believe in God’s gracious Passover and forgiveness without actually eating? Of course; faith is a matter of the heart, isn’t it? Doesn’t God condemn the people’s ritualistic observances in Jeremiah saying, “but your heart is far from me?” Yet, God said, “Eat the meal! Really! Eat it! This way exactly!” Why? To live out your faith. To be faithful to me. To instantiate your faith. I think this is perfectly analogous to us and the Lord’s Supper. We must eat the meal, but must not in the way we typically think. Exhibit #2 – When King Solomon worships God before the altar he lifts up his hands in worship (1 Kings 8:22). We’re instructed in Psalm 134 to “lift up your hands” and “bless the Lord!” Can you worship God without lifting up your hands? Doesn’t Jesus say true worshipers must worship in spirit and truth; he never mentions anything about hands. Here’s another example of instantiation; we embody worship, we externalize the joy in our hearts when we lift up our hands, when we sing songs of praise, when we make real offerings and sacrifices to God. Sometimes, I lift up my hands in worship even when I don’t want to because I want to practice my faith, embody my faith. Exhibit #3 – The people of Israel were required to sacrifice bulls and goats to God. Hebrews 10 tells us, though, that it was impossible for our sins to be covered and taken away by such blood. So, why did God demand it? For the same reason I mentioning everything else: God wanted them to live out their faith; to embody it sacrificially. I think he even wanted them to see the requirement of death before their eyes so they knew what was happening. Faith that’s just in our heart, just in our heads isn’t real faith. Faith that never serves, never gives, never kneels, never says kind words, never apologizes, never forgives, never is patient isn’t real faith, my good brothers and sisters. Be careful that your faith is more than in your heart. 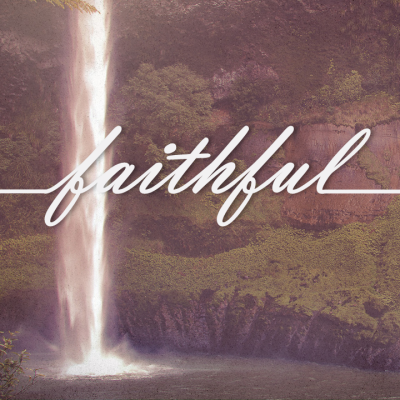 Look for ways to embody your faith; to be faithful. I actually believe you will see a reciprocal benefit; even when you do things you don’t have to do God will use your practice of faith to serve and strengthen your heart.